Regular expressions use to detect patterns in strings of text. 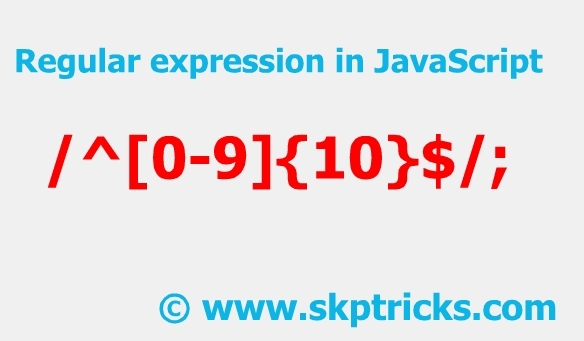 Regular expressions provides a quick and easy way of matching a string to a pattern. Validation of mobile no, username, email id, website url are possible through Regular expressions. Shows a alert message "match found"
Based on above example, we will validate regular expression with different string patterns. Input should allow any characters followed by "abc"
[a-z] should matche any character from lowercase a through lowercase z. [A-Z] should matche any character from uppercase A through uppercase Z. [a-Z] should matche any character from lowercase a through uppercase Z. [a-zA-Z0-9] Characters range lowercase a-z, uppercase A-Z and numbers. (com|info) Input should be "com" or "info"
Validating website URL using Regular Expression. Validating Mobile Number using Regular Expression. 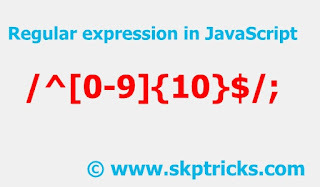 This is all about the Regular Expression validation, if you have any queries please do comments in comment box.